The Wiarton Keppel International Airport is proudly owned and operated by the Township of Georgian Bluffs and has served the residents of Grey Bruce region for more than 70 years. Take a look below at the history our airport, including the dedication to Canada's first female pilot, Eileen Vollick. The airport was built by the Canadian Federal Government in 1948 as an emergency air field on the Toronto/Winnipeg corridor, originally operating two 4,100 foot runways and a radio range station. In 1954, runway 05-23 was extended to 6,000 feet to accommodate larger planes and jet aircraft. This runway was later refurbished and reduced to 5,000 feet. In 1970, a new operations building was built to accommodate passengers and administrative offices. Today, the building provides space for Canadian Coast Guard radio station, and 24 hour Human Weather Observation system (HWOS). HWOS provides quick, accurate and reliable weather reporting where manned weather observations are an integral part of aviation operations. On Oct 18, local officials met to discuss the future of the Wiarton Airport. It was proposed that three local municipalities, Wiarton, Keppel and Amabel Township would take over the airport for 3 years, with the hope to continue for 10 years, when the property will be owned by the municipalities. On August 2, 2008, the Wiarton Keppel Airport officially renamed their main terminal building after Eileen and unveiled a wall mural in her honor, as well as a newly-erected heritage stone marker in a specially designated parkette, created by COPA Flight 68 members. South Bruce Peninsula council and neighbouring Township of Georgian Bluffs council reached an agreement over the sale of the Wiarton Keppel International Airport, making Georgian Bluffs the new owners. Mary Eileen Vene Riley was born at home in Wiarton, Ontario on August 2, 1908, to James Henry Riley and Maria (Mary) Vane Baines Riley. When Eileen was three, her father was killed in a mining accident. Her mother remarried, and Eileen received her stepfather George Vollick's last name. The newly formed family moved to Hamilton, Ontario. Eileen worked at the Hamilton Cotton Co. as a textile analyst and assistant designer. Both from her bedroom window and on her way to work each morning, she watched takeoffs and landings at Jack V. Elliot's Air Service and longed for the opportunity to learn to fly. She was the first woman to apply to the Department of National Defence seeking authorization to learn to fly commercially, and was granted permission to take flying lessons when she turned 19. While waiting for her 19th birthday, she became the first Canadian woman to parachute into water. She walked the wings of a Curtiss JN-4 (often called a "Jenny") and became the first Canadian woman to parachute into water (2,800 feet into Hamilton Bay, which has since been renamed Burlington Bay). 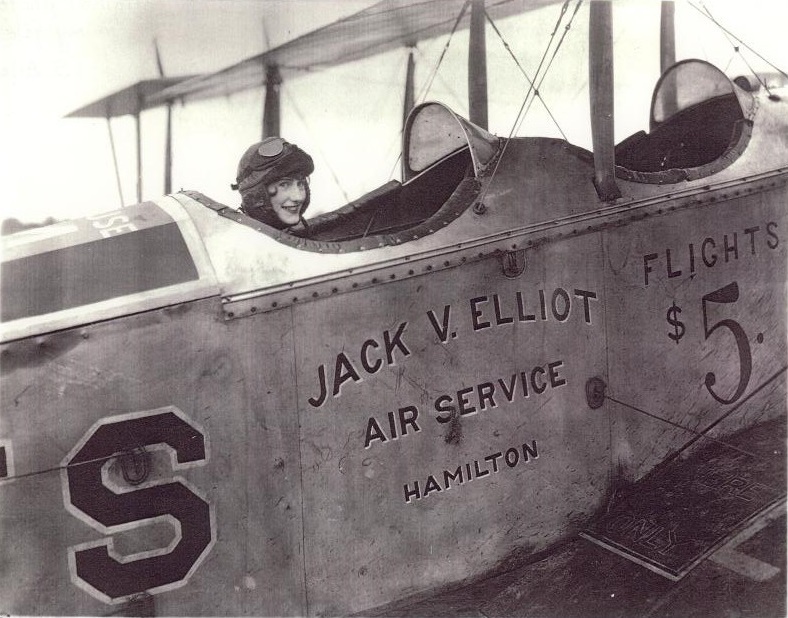 When her 19th birthday arrived, Vollick officially became a student at Jack V. Elliot's Flying School at Ghents Crossing overlooking Hamilton Bay. Despite doubts, she was determined to earn her license. She took 6am lessons before going to work at 8:30am. Pilots Earl Jellison, Lennard Tripp and Richard Turner served as her instructors and also taught her aviation mechanics. As Eileen weighed a mere 89 pounds and was only 5 feet 1 inch tall, she used pillows to prop herself up to see out of the cockpit of the Curtiss JN-4. On March 13, 1928, she received time off from her job at the Hamilton Cotton Co. in order to take her federal aviation test. Flying a ski-equipped Cutriss "Jenny", she demonstrated her knowledge of take-offs and landings on the frozen bay. In order to pass the test, she had to make four landings from 1,500 feet and land within 150 feet of a designated point on the ground. An additional landing had to be executed with the motor off and the pilot had to land within 5,000 feet of a designated point, as well as five figure-eight turns between two designated points and the completion of a 282km cross-country trip. Eileen successfully performed all of the requirements and was issued a Private Pilot Certificate No. 77. This daring young woman went on to perform acrobatic flying throughout North America. Her courage and skill opened the wonder of the skies for succeeding Canadian women pilots. Shortly after obtaining her license, Eileen met James Hopkin. They married on September 28, 1929. Eileen chose to retire from her flying career to raise a family, declining a position to fly an event with Amelia Earhart and another female pilot. She and James settled in New York and raised two daughters, (Audrey Joyce Miles and Eileen Barnes), where she lived until her death on September 27, 1968. In 1975, the First Canadian Chapter posthumously awarded Vollick with an Amelia Earhart Medallion. In 1976, the 99s and the Ontario Heritage Foundation held a ceremony to reveal a plaque at the John C. Munro Hamilton International Airport commemorating Vollick's accomplishments. One of her instructors, Lennard Tripp, was present at this ceremony. 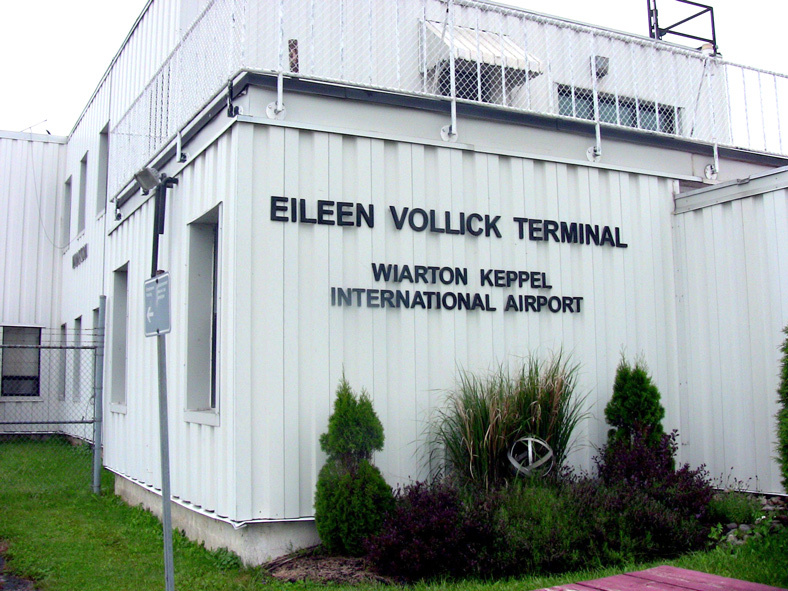 On August 2, 2008, the Wiarton Keppel Airport officially renamed their main terminal building after Eileen and unveiled a wall mural in her honor, as well as a newly-erected heritage stone marker in a specially designated parkette, created by Flight 68 members. To learn more about Eileen Vollick, the website Canada's History wrote an article entitled "Unacquainted With Fear" that outlines Eileen's life and career in aviation.